All baseball managers have strategies, and all manager strategies are supposed to function to maximize a team’s chances of winning. They don’t all work out that way, of course, and one need only explore the world of sacrifice bunts, but the managers’ hearts are in the right place. When managers get involved, they do so because they believe their involvement will bump the chances of winning the game. And managers don’t like to concede a game before it’s over, and one could never be critical of a manager for not giving up. There always exists some chance of victory, before the conclusion, and there’s something noble about pursuing long odds. But the necessity of managerial involvement follows a spectrum. In close games, in high-leverage situations, it makes the most sense to try something strategic. In not-close games, there’s hardly any benefit, so while such strategizing isn’t pointless, it is the most pointless. As a sort-of example, the Giants closed out the Cardinals in the NLCS in Game 7. The Giants were up 1-0 after one, 2-0 after two, and 7-0 after three. It was still 7-0 at the seventh-inning stretch, with the Giants at home. They’d add two more runs, just for the hell of it. In the top of the eighth, Bruce Bochy replaced Santiago Casilla with specialist Javier Lopez. In the top of the ninth, with two outs, Bochy replaced Lopez with closer Sergio Romo. Bochy managed as if the game were close when it wasn’t, and there wasn’t much in the way of benefit. But Bochy gets a pass, because (A) whatever, and (B) it was Game 7 of the NLCS and those are high stakes. This was essentially pointless strategizing in a very important baseball game. What you’ll find below is an example of mostly pointless strategizing in a very much less important baseball game. Last year, around Major League Baseball, there were 1,055 intentional walks issued. (Zero to pitchers.) Of those, 993 went four pitches. 57 went five, two went six, two went seven, and one went eight. The Dodgers issued the most, with 62. The Reds were issued the most, with 54. Aaron Harang issued ten by himself. Joey Votto and Prince Fielder both were issued 18. Of all intentional walks, 93 were issued by teams in the lead, while 607 were issued by teams who were trailing. The rest, obviously, came with the score tied. I found myself wondering about the most pointless intentional walk. There was no such thing as an utterly pointless intentional walk, but there would’ve been a most pointless intentional walk, and it would’ve come in a low-leverage situation. According to Baseball-Reference, 250 intentional walks were issued in what they define as being low-leverage situations. Of these, 107 came in situations with deficits of at least four runs. Five came in situations with deficits of six runs. Five came in situations with deficits of seven runs. One came in a situation with a deficit of eight runs. One came in a situation with a deficit of nine runs. And one came in a situation with a deficit of ten runs. Once last year, a team issued an intentional walk in a game in which it was trailing the opponent by double digits. I’m satisfied in referring to this as the year’s most pointless intentional walk. 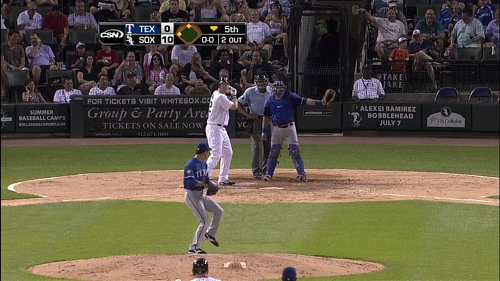 It was issued on July 3, in a game between the Rangers and the White Sox. 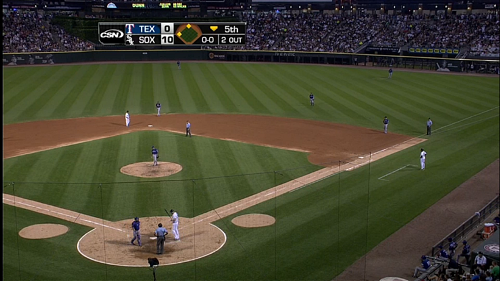 At that point, the Rangers were a good team, and the White Sox were a pretty good team. It was a Tuesday, and it was late, locally, and Roy Oswalt started opposite Chris Sale. The White Sox scored four runs in the bottom of the first, then they added another three in the bottom of the second. It was 7-0 then, and it remained 7-0 going into the bottom of the fifth. More damage would be done. Oswalt faced six batters before getting yanked, and Yoshinori Tateyama immediately allowed an RBI single. The hit made it 10-0, and put runners on second and third, having advanced on a throw home. So it was 10-0 Chicago in the bottom of the fifth, with two outs and runners on second and third. Lefty Adam Dunn was coming up to face righty Tateyama with righty Paul Konerko on deck. Perfectly sensible, given the numbers. Except for the score numbers, which showed Texas having a zero and Chicago also having a zero, except with a one in front of it. In a double-digit ballgame, Ron Washington played the platoon splits, and no other manager did that all season. Neither the Texas broadcast nor the Chicago broadcast expressed much in the way of surprise. They talked about the intentional walk as if it were any other intentional walk, intended to get the better matchup for the pitcher. 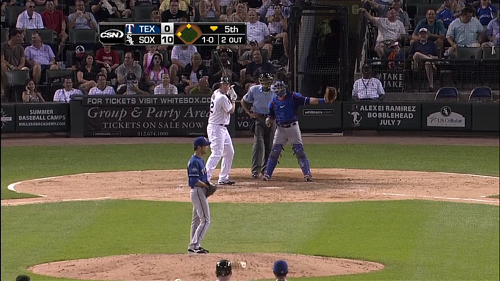 Sure enough, Tateyama got to face the righty Konerko like he wanted. Konerko singled. Then Alex Rios singled. Then A.J. 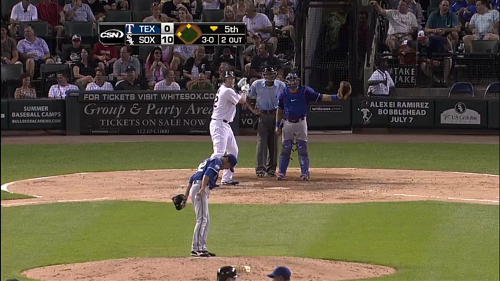 Pierzynski homered. The inning ended with the score 16-0. The game ended with the score 19-2. Not that the ultimate outcome has anything to do with the decision, but this would be a forgotten intentional walk. At least until right now. According to Baseball-Reference, the leverage index at the time of the walk was 0.00. According to FanGraphs, it was 0.02, which is infinity times higher. The walk served little purpose, and the walk didn’t work. Incidentally, the crowd didn’t respond when the catcher first stood up and signaled for the intentional walk. The boos only began to cascade down upon the throwing of the first pitch. If we can even refer to those as being pitches. From a statistical perspective, the move was perfectly justifiable. Tateyama hasn’t shown that he can pitch to lefties. He has shown that he can pitch very well to righties. 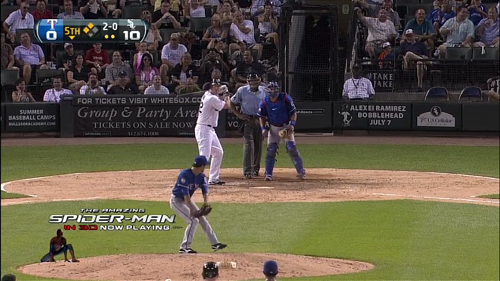 Dunn is a lefty and Konerko is a righty and there was a base wide open. Chicago’s a small ballpark and Texas had a powerful offense, so a comeback wasn’t impossible. This is why there’s no such thing as a truly pointless intentional walk. There’s always a point. There’s always an argument in favor, leaning on the existence of a non-zero game situation win expectancy. But while there might be no pointless intentional walk, there is a most pointless intentional walk, relative to the group. In a double-digit ballgame, Ron Washington could’ve elected to let Tateyama try something against a lefty with the stakes really low. That’s a good opportunity to mess around, in a situation of minimal consequence. Washington played it by the book, and the Rangers still got blown out. No, it didn’t significantly slow down the game. No, I wouldn’t characterize it as being objectionable. The walk is just a thing that was, that didn’t need to be. We hoped you liked reading The Year’s Most Pointless Intentional Walk by Jeff Sullivan! As a Ranger fan, I’m shocked to find out that Wash would make a questionable decision! Sort of. Alright…maybe I’m not.